Journal clubs have typically been held within the walls of academic institutions and in medicine have served the dual purpose of fostering critical appraisal of literature and disseminating new findings. In the last decade and especially the last few years, online and virtual journal clubs have been started and are flourishing, especially those harnessing the advantages of social media tools and customs. This article reviews the history and recent innovations of journal clubs. 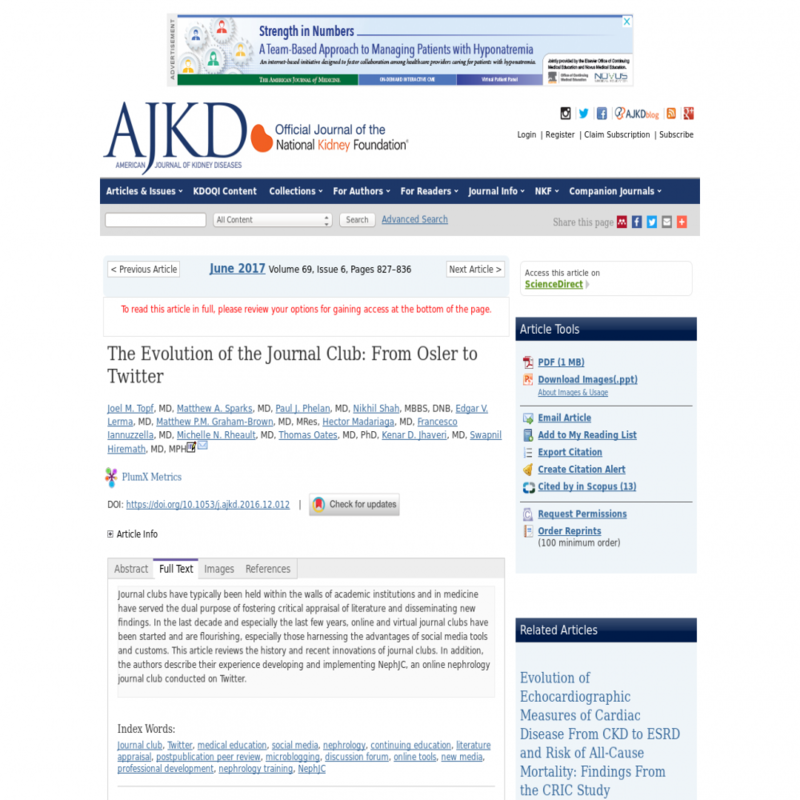 In addition, the authors describe their experience developing and implementing NephJC, an online nephrology journal club conducted on Twitter. Symplur Signals provides researchers with a simple research interface, rich datasets, powerful filtering, and algorithms with natural language processing capabilities optimized for our context of healthcare. Get access to up to 7 years of history from this trusted academic research platform. See the full list of healthcare social media research articles with data from or reference to Symplur. #hcsmR is a collaboration between Stanford Medicine X and Symplur. The Altmetric Attention Score is based on the attention a research article gets on the internet. Each coloured thread in the circle represents a different type of online attention and the number in the centre is the Altmetric Attention Score. The score is calculated based on two main sources of online attention: social media and mainstream news media.